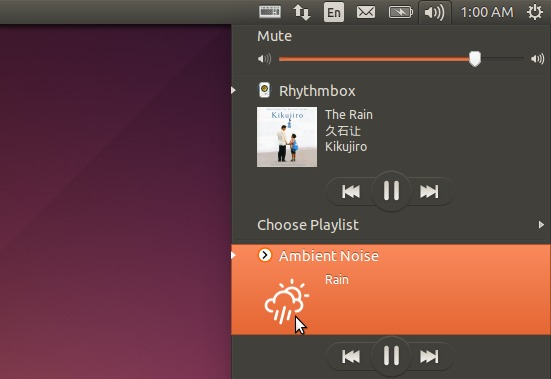 Is there any way to control moc from sound indicator in ubuntu like Rhythmbox ? Does sound-indicator Control Applications Directly? After a quick DDG search for sound-indicator in Ubuntu I found no description of what it was, but from what I've managed to piece together it talks directly to PulseAudio and not individual audio applications. While a PulseAudio sound driver is in the pipeline for MOC (but awaiting a response from its contributor) you can use PulseAudio's ALSA emulation to route the output of MOC's ALSA sound driver through PulseAudio. So the answer would appear to be that you can already achieve what you want, but in the absence of easily-found and clear information on sound-indicator this involves some guesswork. I've looked again for a good technical description of "sound-indicator" but again found nothing. I did find a source package, but the README says exactly "", and I don't have time to go code diving. The OP seems to have disengaged, so I'm entitled to assume he went away happy. Could you give that link ?